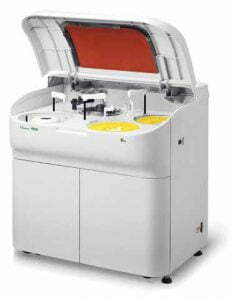 The Gesan Chem 400 auto-chemistry analyzer is a high-performance routine analyzer. 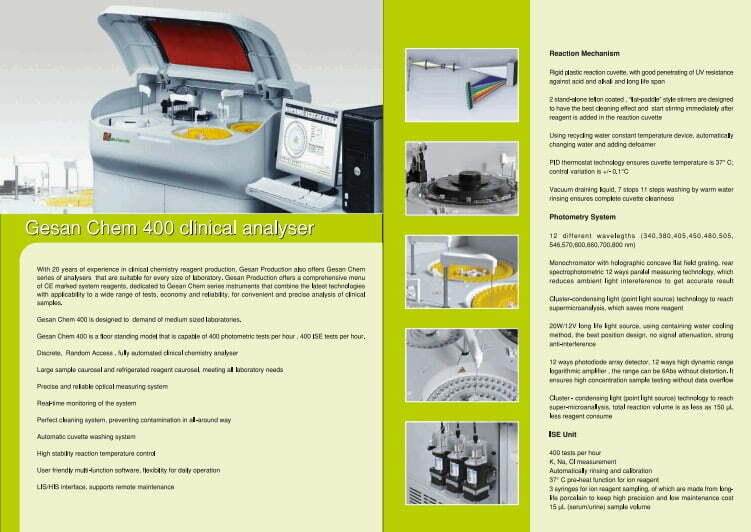 It is the ideal instrument for medium sized laboratories. It offers a performance of up to 88 photometric items and 3 ISE items analysis simultaneously. > Holographic concave flat field grating with rear spectrophotometry and cluster optical path to achieve micro volume detection of reaction solution. > 60nm polished probe with functions of clot detection, collision protection and automatic resetting. > Liquid level detection to reduce carry-over contamination on probe surface. > 2 refrigerated reagent compartments with 90 reagent positions and 1 sample compartment with 115 sample positions. > Connectable to LIS/HIS system to realize remote operation and maintenance.